In the words of a Senior German Officer “He who holds Hill 112, holds Normandy”. Join the epic battle for this key feature and the control of Normandy. Take command of Infantry and Armor to control key terrain features on Hill 112 and the surrounding countryside. This epic battle waged for over 4 weeks with the hill and surrounding objectives changing hands several times. Can you take and hold this vital piece of high ground the key to Normandy? 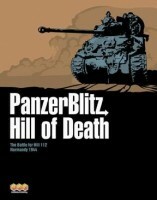 Panzerblitz: Hill of Death is based upon the timeless classics Panzerblitz and Panzer Leader. It has been thoroughly updated, though, to remove the known issues with the old games while adding a whole new artistic look. Panzerblitz: Hill of Death uses a single 22"x32" mapsheet which is based upon historical maps of the period. The hex scale is 250 yards/hex. Beautifully detailed, yet totally functional for the game, the maps reflect the battlefield as it actually was - no generic terrain for these battles. 8 scenarios are included in the game, varying in size from small to large so that gamers will be able to enjoy Panzerblitz: Hill of Death whether they have a whole Saturday of gaming lined up or an hour before its time to put the kids down for the night. Add a Review for "Panzerblitz: Hill of Death"